Lost Vape Triade DNA250 Review - Daily Vaping Deals & The Best Vape Product Reviews at Vaping Cheap! Lost Vape has released a ton of great products in 2016. Even back when they first released their original DNA40 devices, they were of high quality and certainly impressed many vapers. When they first released the original Triade DNA200, it was a huge success. Now with the Evolv DNA250 board available, it was only a matter of time before they implemented it into the Triade, and releasing it to the market. Before getting any further, I would like to thank Gearbest for sending this product my way for the purposes of this review. I will go over my first impressions, my experiences using the device, performance and conclude with whether or not I recommend the Lost Vape Triade DNA250! Check out the Lost Vape Triade DNA250 Here! Click Here to Check out the Lost Vape Triade DNA250! When I received the Lost Vape Triade DNA250, what I noticed first was the unique packaging. The packaging of Lost Vape products are always top notch, and this one is no different. This device came in an elegant packaging, and honestly this is the type of packaging you would expect with a much more expensive device. The packaging itself does say Triade, and has a magnetic tab where you can easily open it. 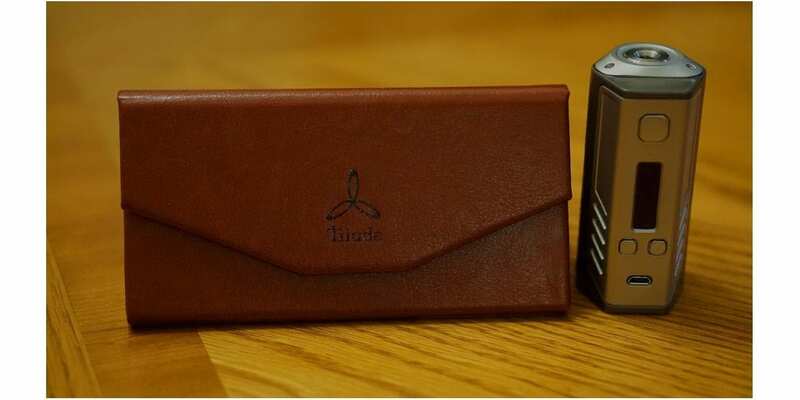 Upon opening the packaging, you are greeted with the Triade DNA250. My first impression of this device was that it’s certainly good looking. I could smell the genuine leather when first opening it as well. Included in the packaging, you also receive a micro USB cable which can be used for charging and firmware upgrading, a warranty card and a user manual. When first holding the Lost Vape Triade DNA250, it felt great in the hands right away. This box mod is definitely ergonomic, which is a huge pro. The leather was nice and smooth. In my opinion, it’s a huge pro that this device features genuine leather rather than fake leather. It certainly gives this box mod some class. Honestly, the overall quality of this device is fantastic, and was certainly impressed by it. It did have some weight to it without three 18650 batteries installed, but it was on the lighter side. The design of this device in comparison to the original is relatively the same. I didn’t have the original to compare to, but from what I’ve seen the design is basically the same. However, the major difference was the battery compartment. Since the DNA250 has additional safety features, the battery protectors from the Triade DNA200 is not needed in this version, which means getting your batteries in and out is much easier. I know some vapers who complained about this specifically with the Triade DNA200, so with this new version, there’s no worries in regards to this. I do want to mention that there is zero button rattle with this device. This is a pro in my book, as I know many vapers who tend to get annoyed by button rattle. Plus, this shows the great quality of this device. Also, the buttons are nice and clicky. All in all, my first impressions of the Lost Vape Triade DNA250 were positive. The fit and finish of this box mod is amazing, and it felt great to hold right away. This box mod does require 3 high drain 18650 batteries, and I do recommend that you use 3 batteries that are married. If you’re unfamiliar with battery safety, definitely check out our battery safety article here. As mentioned previously, it’s really easy to get batteries in and out of this device. To install your batteries, you can utilize the spring loaded contact, and the same can be said when taking your batteries out. The batteries do stay in place securely, and I never had an issue with my battery wrappings being ripped or damaged. When adding 3 high drain 18650 batteries, it added a substantial amount of weight to the Lost Vape Triade DNA250. This is to be expected of course, since it is 3 batteries rather than 1 or 2. Even though it was heavier, it gave it the feeling of having something valuable in your hands. Honestly, I got used to the added weight rather quickly, and actually liked the extra weight with the batteries. Something worth mentioning is that you might have a hard time opening the battery door itself, especially if you’re nails are cut short. The battery door is firmly in place which is a good thing, but in order to get it off, you do need to insert your nail into the side tabs. Not the biggest con, but still have to be mentioned. As mentioned previously, the Triade does feature an ergonomic design, and it really is comfortable to use and hold over a period of time. The ergonomic design mixed with its excellent build quality gave this device a great feeling in the hands. Also, you can easily access the firing button with either your pointer finger or thumb, either way it was comfortable to use. Also, carrying this device around with me in my pocket was perfectly fine. Typically, I do carry dual 18650 box mods with me when I’m out and about. 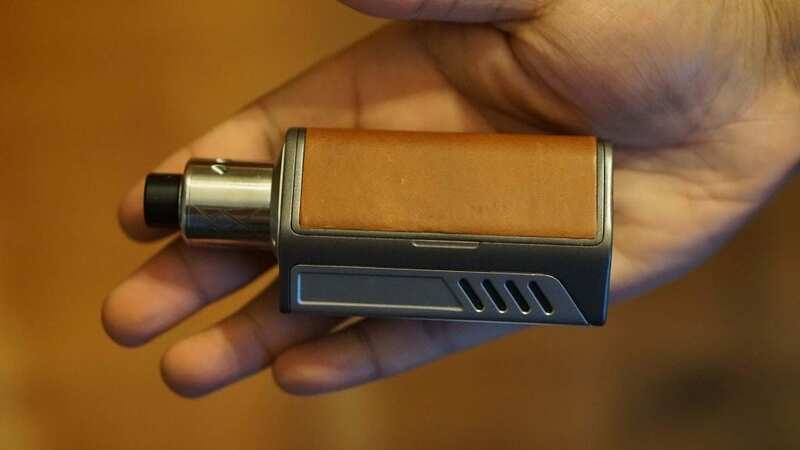 The Triade DNA250 is a bit bigger than most other dual 18650 box mods, and it is a bit heavier, but I didn’t mind the extra weight nor the bulkiness in my pocket. Also, for the ladies, I do think this device would fit well in larger purses, but nothing small since it is a bit on the bigger side. Even after using this device after some time, the leather battery door has held up quite well. However, I’m not too sure with how it will hold up over an extensive amount of time. I will come back and report if there were any issues with the leather, but so far it has been great. I do want to mention that the battery life was great with this box mod. With three high drain 18650 batteries, it is to be expected. 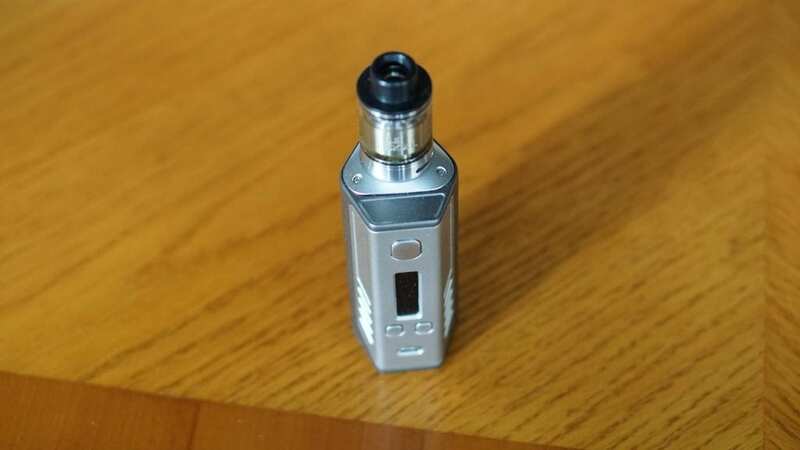 However, depending on the wattage you prefer to vape at, it will determine the battery life. Even when vaping at 100w, I can get through almost the entire day with no issues. 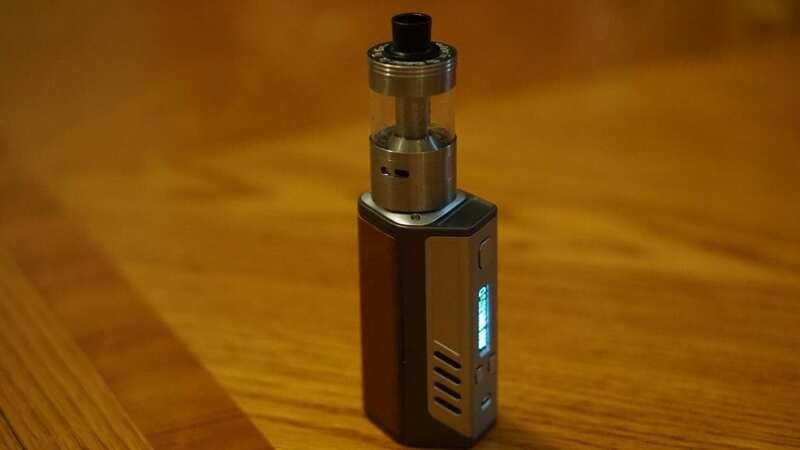 When vaping at lower wattages, say 50w to 60w, I can easily get almost two full days of vaping, which is certainly impressive. All of my atomizers screwed down and made a connection. Also, even atomizers with protruding 510 pins were flush, which is a huge pro in my opinion. 30mm atomizers do look pretty good, but it does hang over slightly, but since the 510 connection is in the middle of this device, it does not overhang over the mod itself, as you can see in the picture shown in this section. The 510 connection fits up to 25mm atomizers with no issues. Smaller 22mm atomizers may not look the greatest since this device is larger. Overall, my experiences using the Lost Vape Triade DNA250 was great. The battery life was excellent, and it was very comfortable to hold and use over time. This device is powered by the Evolv DNA250 board, so you know with three high drain 18650 batteries you’ll be getting an accurate 250w. I personally do not vape that high of a wattage, so I did not test it all the way up to 250w. Honestly, I think this is more than enough power for most vapers. If you’ve read some of our previous reviews, you can tell we’re huge fans of the Evolv DNA250 board. It has excellent temperature control, and it just vapes great. The power delivery is instant, and the fact that you can customize your device using the EScribe software is a huge pro. With the Lost Vape Triade DNA250, you do get some presets already done for you, which are Watts, Nickel 200, SS 316, Titanium, SS 304, No preheat Nickel 200, Relaxed Nickel 200, and Hot Nickel 200. I do wish they implemented a few more for SS 316, because that’s a preferred wire for many vapers. However, it’s still a huge pro that they already set up a few profiles for you, so if you didn’t want to go into the EScribe software to set anything up, they’ve got you covered! The Evolv DNA250 board is great for vapers who love to tinker, and customize their devices. You can add custom logos, add your own custom wire profiles, adjust the battery settings to the specific batteries you are using and much more. I did test this device all the way up to 200w, which is quite high as I’m a vaper who vapes primarily under 100w. The power was surely there, and my coils ramped up quickly with no issues. If you’re used to the Evolv DNA200 or DNA250 board, the performance of this device is exactly what you’d expect it to be, which is fantastic. The temperature control works flawlessly as well. I only tested SS 316L, as I do not vape Ni200 or Ti wire anymore. I do want to mention that I did test SS 316L Clapton coils, and they worked perfectly as well with this device in temperature control mode. If you’re a fan of temperature control, a device with the Evolv DNA250 board is certainly up your alley, as it provides you with one of the most smoothest temperature control vape experiences on the market today. All in all, the performance of the Lost Vape Triade DNA250 is excellent. The Evolv DNA250 board is one of the best on the market in my opinion, and vapers will not be disappointed with this device in regards to performance. In conclusion, the Lost Vape Triade DNA250 is a solid performing triple 18650 box mod, and has quickly become one of my favorite devices to use. I get excellent battery life, especially when vaping at lower wattages, and even when vaping at higher wattages, I get through at least most of the day. Honestly, I didn’t really find any cons to this device, and most of the cons I had to really search for. Like mentioned previously, the leather has held up just fine with using it over time, but that can of course change. Also, 30mm atomizers do look pretty good on this device in my opinion, and the other con mentioned is subjective. Lost Vape really did a good job on this device, and if you’re a fan of the original, then you’ll love this new version. The overall fit and finish of the Triade DNA250 is fantastic, and I was certainly impressed when I first opened the packaging. All in all, if you’re looking for a new triple 18650 box mod, I can easily recommend the Lost Vape Triade DNA250!